I’m gonna admit it- I woke up on the wrong side of the bed this morning. Actually, it was the wrong side of the couch. Between the snoring husband and the possum that was taunting the dogs all night I was pretty much in the mood to throat-punch people and was bracing myself to have to control those impulses in the name of a friendlier downtown revitalization. To top it off, I’m one of those obnoxious eye-rollers when it comes to St. Patrick’s Day. I wear green only as a precaution- and today I was in no mood for would-be pinchers. A real Grumpy-Wumpus. That all changed at about 9:45 this morning when our great friend Eugene from Suzy’s Beauty Supply dropped by with a gift for us- a bag full of bright green hair extensions! Nothing can calm the savage sleepy soul like a bag full of fun! So thank you Suzy’s Beauty Supply, you’ve made our day! And Happy Saint Patrick’s Day, be safe and have fun! 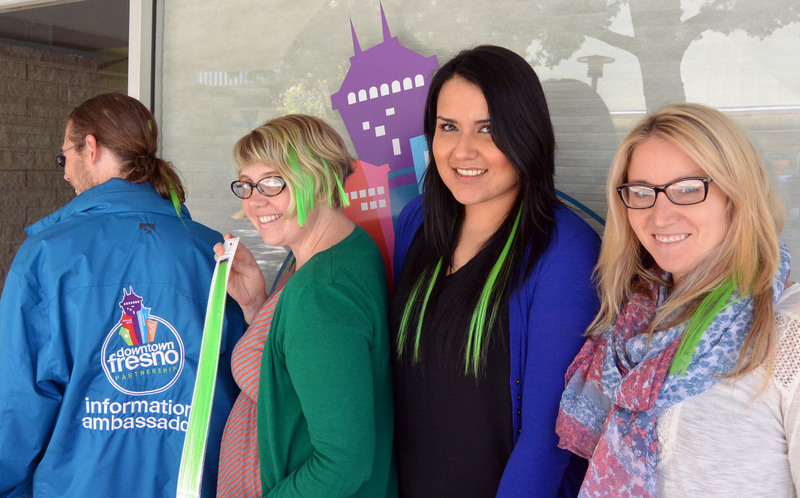 Get your own fun extensions at 1024 Fulton Mall, and be sure to check out their awesome e-commerce shop.